Last month we went over some of the legal issues with flying unmanned aircraft in the UK, especially if you attach a video camera to them and charge for your services as an aerial videographer. This month, let's look at what you need to get started kit wise in this business. First of all, I would like to point out that this is a suggested start-up solution, and there are literally thousands of options of aircraft, cameras and accessories to choose from. However I am going to concentrate this article on putting together a good start-up system that will give amazing results, yet be easy to fly and importantly not so expensive to repair when you crash, and you WILL crash. First and foremost is the aircraft, what should we look at for starting out in this business. Well as tempting as it is to say "I'm going to get a machine I can stick my Red Epic in and shoot some movie quality footage" I would put it to you, that this may not be the wisest of choices. Remember you WILL crash, and a machine that can carry a Red Epic is an expensive piece of kit, not to mention that when you do crash you will be crashing a very heavy piece of large flying machinery to the ground on top of your rather nice and VERY expensive Red Epic. Let's be clear here, the camera of choice to get VERY good footage and know that it will survive a crash is the GoPro. Anything larger and you will have to start thinking of bigger, more expensive flying machines. So GoPro it is, and now with the new Hero 4 Black available with 30fps 4k, we should get even better shots out of these amazing little cameras. So what shall we use to carry the camera, Well we have a number of choices. A ready to fly model from the likes of DJI and Walkera or do we build it ourselves? There are a lot of advantages to building an aircraft ourselves, one of the main ones being the ease of fixing when you crash it. However to start with, a ready to fly aircraft would be a better choice. Now to be honest, there are other options out there for RTF aircraft but DJI have in my opinion the best and that's the Phantom 2. You can fix a GoPro to it, and no DJI camera is as good as that in my opinion. The control is 2.4 GHz as opposed to 5.8 GHz. 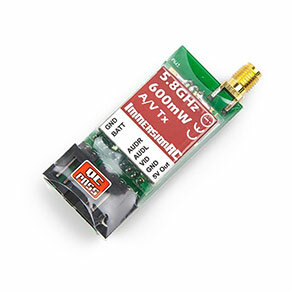 The standard frequency for controlling remote aircraft these days is 2.4 GHz, if you want to upgrade your transmitter you need a 2.4 GHz aircraft. Also the 5.8 GHz frequency is what we use in the UK to send a video signal down to a screen so we can see what our camera is viewing. I understand why DJI flipped the two frequencies around for the other version of the phantom, but you will not be able to upgrade, or fly those aircraft around any other remote control aircraft as there will be BIG issues of interference. So we have a nice DJI Phantom 2, we stick our GoPro in the housing underneath and set off to shoot some amazing footage. All excited we offload the memory card to our computer to look at it and a wave of massive disappointment overcomes you. "What!! it's all shaky and the image is like jelly!!" you say to yourself. And the reason being? Well you need a gimbal, you need your camera to be detached from the vibration and movement of the aircraft in order to give you a stable, smooth image. Gimbal's work by compensating for the movement of the aircraft as it flies. So if the aircraft tips forward in order to fly forwards the gimbal will tilt the camera up just the right amount to compensate for the aircrafts nose moving down. This keeps the camera perfectly level. With a three axis gimbal attached it can do this for the left-right, up-down and rotation of the aircraft. The results are extraordinary, you suddenly get a smooth video with little jello. 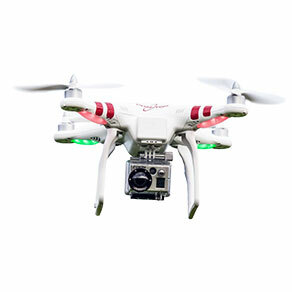 There are a number of gimbals you can get for the Phantom. The cheaper ones have the ability to work brilliantly, however they need setting up and fine tuning to get the best out of them. The best one for the Phantom is the Zenmuse Gimbal that DJI themselves can provide. This is a quality piece of kit and is plug and play, no setup required. I want to ensure you that this is not a DJI sponsored article, however, I am recommending their kit a lot, as, for the novice and start-up flyer, everything just works and works well. So we have our camera on a gimbal and the shots coming back are looking good. However you have no real idea what you are pointing the camera at while you are flying. This is where you need a video downlink system. DJI have just released their light bridge system, but it's expensive and really too big for a phantom, it works great, but let's look at a cheaper option. Our GoPro's are recoding HD, or now possibly 4k, but we don't need to view in HD to frame the picture. An SD feed will be fine. So we need to attach a small transmitter to the aircraft to send down a video signal to a monitor. There are a number of these available but the most popular are the immersion RC transmitters. These are very small units and work perfectly with the Zenmuse gimbal and Phantom 2. They come in a number of powers, but note that in the UK you can't go over 200mw. 200mw is a bit feeble and the 600mw version seems to be the most popular as it produces a much more solid image, however I cannot recommend that you get one of these as it's not legal.With this installed you need a monitor to view the image and the Black Pear 7" monitor is great. Amazing quality screen with built in diversity receivers. Even has a built in rechargeable battery. Now with this setup you can see what your camera sees. The only other item I would recommend is some kind of OSD. OSD stand for On Screen Display, we are talking the same sort of display you see in a fighter plane. 1. it shows you your height, and this is important when flying low, as is can be hard to judge by looking at the monitor or aircraft. 3. it shows your battery power! Unlike a remote control car or boat which simply rolls or glides to a stop, if the battery fails on the aircraft it falls out of the sky, not good. 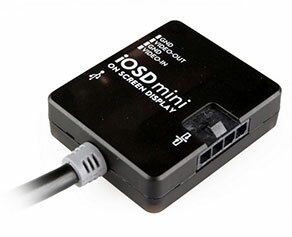 DJI again do a small OSD that is plug and play so I would always recommend you have this installed. This is just a recommendation of a basic setup that will give you excellent results. Just look at Philip Bloom's video he shot in Thailand. This was shot with the same setup as i have been suggesting. There are lot of other things you could look at, like upgraded controllers, different props, you name it. Once you have the bug as with anything like this, it can get very expensive.